The Methodological handbook on MSP in the Adriatic Sea (including Bosnia and Herzegovina, Montenegro and Albania) is intended as a methodological and practical guide aiming to support the future evolution of the MSP approach in the Adriatic Region. In this view it mainly addresses institutional officials, planners and experts on MSP issues, illustrating what they can do to further disseminate and concretely plan and implement MSP in an Adriatic cross-border perspective. The handbook addresses the following issues: policy context, common vision for the future of the Adriatic Sea, approaches and principles for MSP implementation in the Adriatic Sea, MSP step-by-step, links with MSFD. 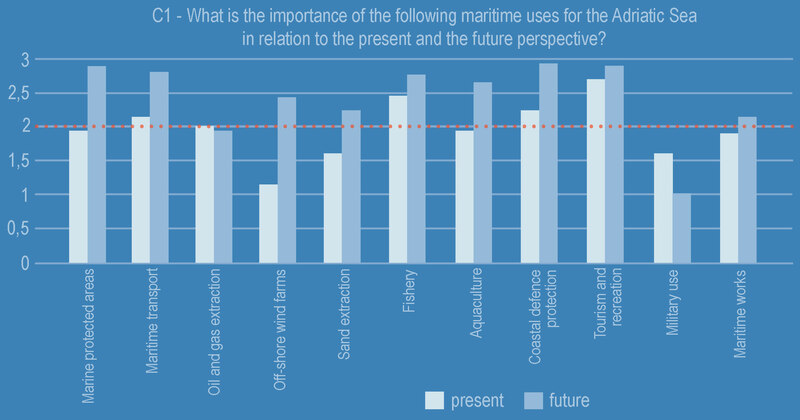 What are perceived benefits and expected challenges of cross-border MSP implementation in the Adriatic Sea? What are key principles that might be highly relevant for MSP implementation in semi-enclosed seas? Can common elements for a future vision of the Adriatic Sea be identified? What are MSP methodological steps to focus on in a cross-border perspective? The methodological handbook on MSP in the Adriatic Sea was developed within the project SHAPE “Shaping an Holistic Approach to Protect the Adriatic Environment between coast and sea”, co-funded by the IPA Adriatic CBC Programme 2007-2013. SHAPE aimed at developing a multilevel and cross-sector governance system for MSP and ICZM in the Adriatic Sea, based on a holistic approach and integrated management of the natural resources, risk prevention and resolution of conflicts among uses and users of the Adriatic coast and sea. Shape started in May 2011 and was concluded at the beginning of 2014. The project in total involved 13 partners representing all Italian coastal regions and eastern Adriatic countries; PAR/RAC of UNEP/MAP also participated in the project. In particular, the handbook was a deliverable of Shape WP4 “Shipping towards Maritime Spatial Planning” aiming to promote MSP in the Adriatic Region through targeted analysis and studies, pilot projects, tools (i.e. the on-line Adriatic Atlas to support ICZM and MSP and the handbook here described) and regional and local stakeholders’ events. In close collaboration with WP3, it also aimed to reach a higher coherence between planning in coastal areas and planning in maritime spaces, binding ICZM and MSP processes in the region. The handbook aims to provide an overall methodological and practical guide supporting the future evolution of the MSP approach in the Adriatic Region. In this view it mainly addresses institutional officials, planners and experts on MSP issues, illustrating what they can do to further disseminate and concretely plan and implement MSP in an Adriatic cross-border perspective. Pilot projects on MSP, including its integration with ICZM and MSFD. Moreover, the handbook gets inspiration from a wide number of MSP initiatives, such as: BaltSeaPlan, Plan Bothnia, PlanCoast, MASPNOSE, the DG MARE studies on MSP in the Mediterranean and the Adriatic Sea (2011) and the UNESCO-IOC guideline on MSP (Ehler and Douvere, 2009). To this regard, an international conference was organised by Shape in Venice (May 2012) in order to grasp suggestions from those experiences and other MSP-related initiatives. The handbook is available in two language versions: English and Italian. Chapter 2 describes the policy context supporting MSP implementation considering the European, Mediterranean and Adriatic levels, and linking to other related policies: Integrated Maritime Policy, Blue Growth, Integrated Coastal Management, etc. Chapter 3 summarises the perceived benefits and expected challenges of MSP implementation in the Adriatic Sea in a cross-border perspective, also considering the relevant role EUSAIR (EU Strategy for the Adriatic and Ionian Region) can play to this regard. 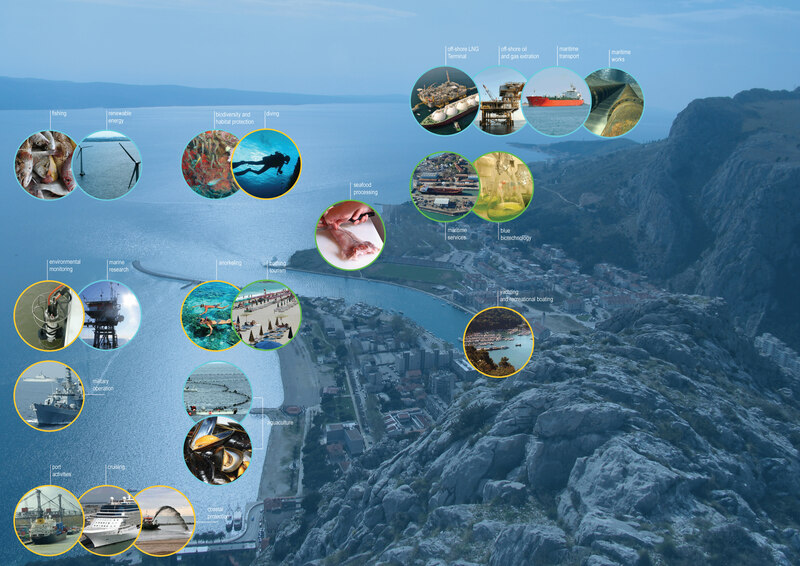 Chapters 4 illustrates the input to a common vision for the future of the Adriatic Sea defined by Shape partners within the implementation of WP4 activities, including environmental, economic, social, governance and cross-cutting elements. 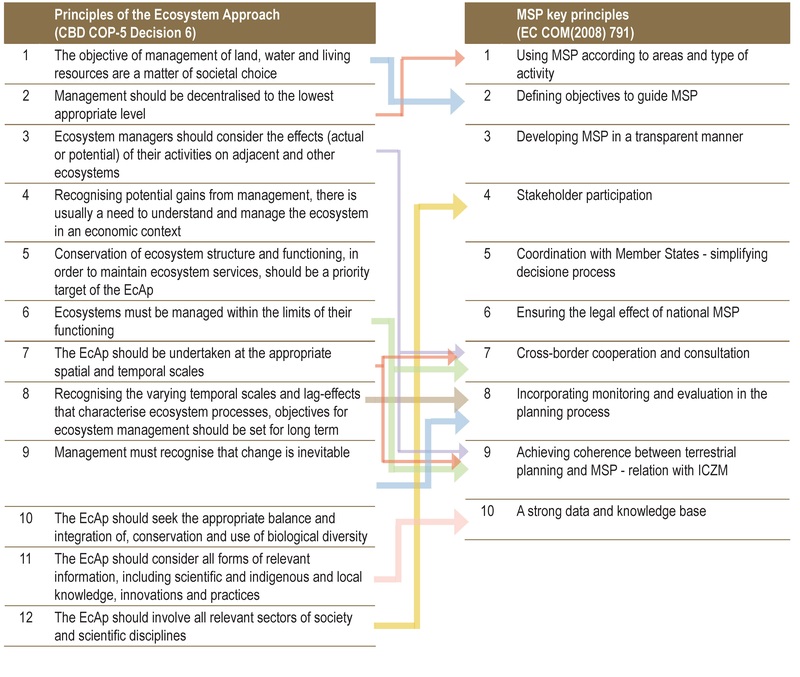 Chapter 5 recognises the ecosystem-based approach and adaptive management as core components of cross-border MSP implementation in the Adriatic basin. The same chapter identifies related key principles (e.g. Pan-Adriatic view, integration, long-term perspective, suitability and spatial efficiency, connectivity, etc.). Chapter 6 describes a step-by step approach for MSP implementation in the Adriatic Sea. The eight identified steps focus on aspects that are relevant at the basin scale and that therefore should be approached through cross-border cooperation. The handbook (and more in general Shape WP4 activities and deliverables) can be of inspiration for cross-border MSP approaches in other semi-enclosed seas. Funding Source: the handbook was developed within the SHAPE project, co-funded by the EU through the IPA Adriatic CBC Programme 2007-2013. Costs: the handbook is one of the final deliverable of the SHAPE project. Its specific cost cannot be defined as it is part of the overall funds to this project.